I’ve been a member of HayNet for about two years now, maybe a little less. At the time, my friend Anne and I had set up our Wanderly Wagons blog to document our experiences as we went to France for four months and then rode 500km in a generally homeward direction. 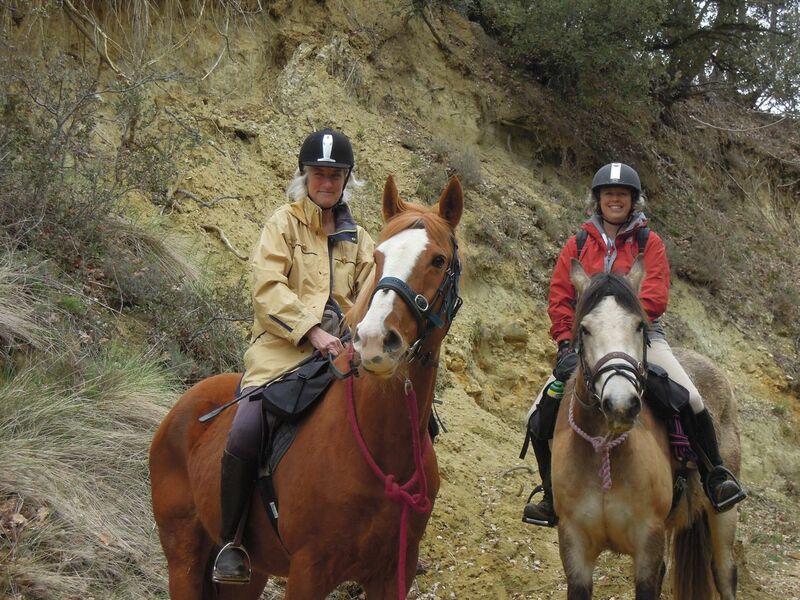 Anne & Gigi, me & Flurry, day 2 of Le Big Trek! New to blogging, I found I loved the Bloggosphere, and I enjoyed reading about other people and their horse lives. I found a few horse blogs via google, but it was hard work as many of the horsey blogs out there have been lying untouched for some time – I wanted to find current, uptodate blogs. I stumbled across HayNet and my search was over! Sam had done my work for me and had found a whole load of bloggers and general horse nuts. I signed up and the rest was history! Anne and I got loads of support from HayNet members as we did our trek, and I feel I’ve made some real friends there. Fast forward to now and my current blog. It started life as Halt, Salute and… because I was competing with Dressage Ireland for the last couple of times in the summer of 2012, just before the LSH and I moved back to France. Earlier this year, I changed its name to Tails from Provence, because it seemed to be becoming less horsey and more about life in Provence, and there certainly wasn’t any Halting and Saluting going on! I wasn’t entirely happy about this, though. I missed my virtual horse friends. Ten days ago, I actually said to the LSH that I was going to try to find something horsey to mention no matter what I was blogging about, because I felt I was moving away from my buddies at HayNet (if I write an unhorsey post, I don’t share it there, it just doesn’t seem right!). So with this feeling of having become less and less of a horse blogger, you can imagine my surprise when I heard I’d been nominated as one of the ten candidates for HayNet’s Blogger of the Year! All I can say is thanks a million to Sam, first of all for setting up HayNet as a sort of central repository for all kinds of Horse Blogs, and secondly for allowing me to be included on the list of potential Bloggers of the Year! Click here to see the other nine nominees, this link will take you to HayNet and you can check them all out there. And if you decide that you want to vote for anyone (ah, ya know, whoever takes your fancy…) click here… but can I suggest you join HayNet while you’re at it? You’ll find a whole new world of Horsey Social Media – think Facebook, but without all the annoying crap that shows up in your newsfeed. Congratulations, I’ve just discovered your blog but had to chuckle at some similarities — I’m building a farm for my four-legged boys and that means negative a zillion dollars, so even though my competition goals are within arm’s reach, I don’t know if I’ll be able to do much snatching in 2014. I find myself posting about wells and tractors and hay, oh my!! Congratulations! I always forget to post my posts to Hay-Net, I feel like I’m missing something that would make it easier. Or am I doing it right and just being lazy? I really like it, when I remember to use it. Congrats! You deserve the nomination, and got my vote!! Just voted for you and hit submit. Good luck!